CHARLOTTE, N.C. - Mitt Romney today asserted that the general election will be about "jobs not dogs," when asked by a radio host today about the media's focus on his former dog Seamus and the president's admission that he once ate dog meat. 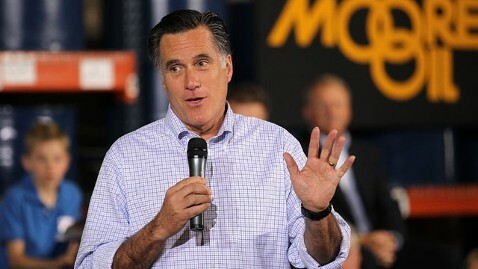 "This campaign is ultimately going to become about jobs not dogs," said Romney in an interview with Bill Cunningham on WLW radio in Ohio. "You recognize of course that some members of the media, and certainly the DNC and the White house itself are going to do everything in their power to divert the attention of the voter from the failure of the president to try to turn around the economy." Cunningham had asked Romney about an interview earlier this week with ABC News' Diane Sawyer in which Ann Romney spoke at length about the 1983 incident in which the Romney's put their family dog Seamus in a kennel on top of their car during a road trip between Boston and Canada. "The dog loved it," Ann Romney said in the ABC News interview when asked about Seamus. "He would see that crate and, you know, he would, like, go crazy because he was going with us on vacation. It was to me a kinder thing to bring him along than to leave him in the kennel for two weeks." Earlier this week, the Daily Caller noted that in the president's own memoir he recalled eating dog meat in Indonesia. But today, Romney appeared uninterested in furthering the story line about his own dog or the president's childhood meals, instead bringing the focus of the interview back to the way President Obama has handled the economy. "He came into the office with economy in a serious slide," said Romney of Obama. "It was his priority, and it's not one that he focused on and solved." "He, instead, focused on an agenda that included Obamacare and Dodd-Frank and cutting back our energy resources in this country and paying back the labor unions by putting labor stooges on the NLRB," said Romney. "Look, he did not do the job that the American people expected him to do which was get us working again." "So they want to talk about dogs, and I want to talk about jobs," said Romney.